Following various red flags, including allegations by none other than the founder of Ethereum and Litecoin that it was running a Ponzi scheme, Bitcoin investment platform BitConnect announced it was closing the company’s cryptocurrency exchange and lending operation after receiving two cease-and-desist letters from state authorities for the unauthorized sale of securities and suffering from denial-of-service attacks. In addition to offering cryptocurrency exchange services, BitConnect offered to let people receive interest on their digital coin balance by lending or investing their capital. It concluded that "This is not the end of this community, but we are closing some of the services on the website platform and we will continue offering other cyptocurrency [sic] services in the future." Both the Texas State Securities Board and North Carolina Secretary of State Securities Division warned that the firm isn’t registered to sell securities in those states, the company said on its website Tuesday. BitConnect offered to let people receive interest on their digital coin balance by lending or investing their capital. According to the statement, the company will "continue offering other cryptocurrency services in the future." The questionnable BitConnect X ICO – which was explicitly named in a cease and desist letter served by the Texas Securities Board – will remain "functional." As Bloomberg notes, BitConnect’s token, BCC, was among the world’s top-20 most successful tokens until its price plunged 65 percent since Jan. 3, as the states announced the actions. Launched a year ago, the coin still has a market cap of over $200 million, after taking a massive dip to $33, ot -87%, as per CoinMarketCap. By comparison, its value fluctuated around the $425 mark less than 10 days ago. 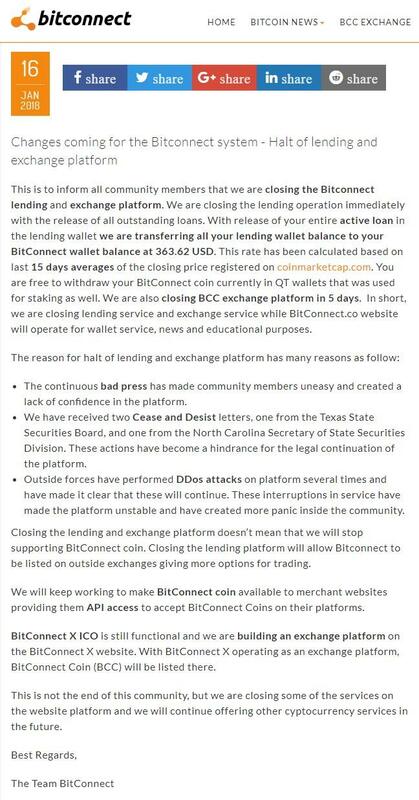 In addition to its legal trouble and inability to protect itself from continuous DDoS attacks, the company blamed the closing of its lending and exchange services on “bad press.” That is despite the fact that most of this bad press circulated around the severity of their legal troubles. According to the Next Web, prior to the closure, "the shady Bitcoin investment scheme was mired in a litany of legal troubles, including cease and desist orders from the UK in November, as well as two more from from the US this month – one from the Texas Securities Board and one from the North Carolina Securities Division." Leading up to the announcement, BitConnect promoters suddenly began distancing themselves from the project. Coincidentally, the website was struggling with a series of server downtime – all of which began shortly after the cease and desist orders rolled in. News of BitConnect's closure, which were specific to what many had deemed a "shady business" hit on Tuesday afternoon and were widely anticipated by many in the business, and hit around the time the wave of cryptocurrency selling accelerated, briefly dragging bitcoin below $10,000. It is unclear how much of the broader selloff was catalyzed by the news of BitConnect's woes , but judging by the sharp rebound in bitcoin and its digital currency peers in the past hour, the market appears to be re-normalizing slowly, realizing that the crackdown against BitConnect is not a broader attack on the cryptocurrency space but merely removal of some of the better known "bad actors."